In the 1920's. John Gibbon was head of publicity for the Canadian Pacific Railway, which had several hotels and lodges in the National Parks. In order to lure tourists into the parks, Gibbon felt it necessary to offer them something other than just food and lodging. The Trail Riders of the Canadian Rockies came into existence in 1923 (horse riding in the backcountry). There were a number of outdoor enthusiasts who either lived in Banff or came to the Rockies every summer, who felt the need for some organization which would do for hikers what the Trail Riders was doing so successfully for those who traveled the trail on horseback. Gibbon came up with the Sky Line Trail Hikers of the Canadian Rockies, which held its first outing in 1933. For the first three summers, one four-day outing was offered to over 50 international hikers, who traveled between lodges in the parks. But the moving of camp materials on a daily basis was a problem, so starting in 1936, camps were set up at a single location each summer. From 1933 to 1935, hikers traveled between lodges in the mountains. 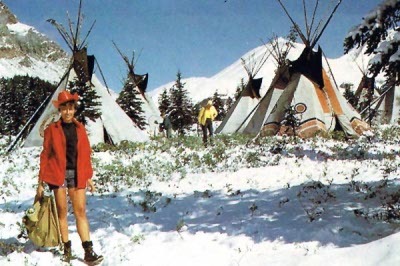 From 1936 to 1969, hikers stayed in tepees, as shown below. 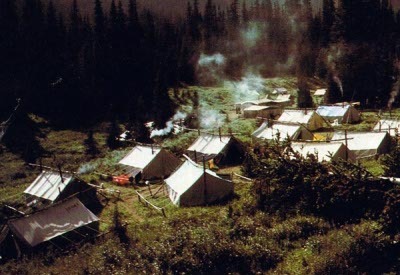 By 1970, prospector style tents were adopted by Skyline. For some time these were considered "six person" tents; they are now more comfortably shared by up to four hikers. The number of interested hikers has grown throughout the years. In 1961, CPR terminated its sponsorship of the Hiking Club. However, through the hard work of interested individuals, the Skyline Hikers of the Canadian Rockies became a non-profit organization that now offers five one-week camps each summer in various locations in the Rockies. Letterhead used in the 1970s and 1980s is shown below. Note the use of the word "Trail" in the organizations name. This was a legacy from the days when the Skyline Hikers was sponsored by the Canadian Pacific Railway, along with its sister organizations the Trail Riders of the Canadian Rockies (est. 1923) and the Ski Runners of the Canadian Rockies (est. 1931), as a way to draw clients for its hotels in Banff and Lake Louise. 1935: Healy, Egypt, Shadow, Castle Mt.